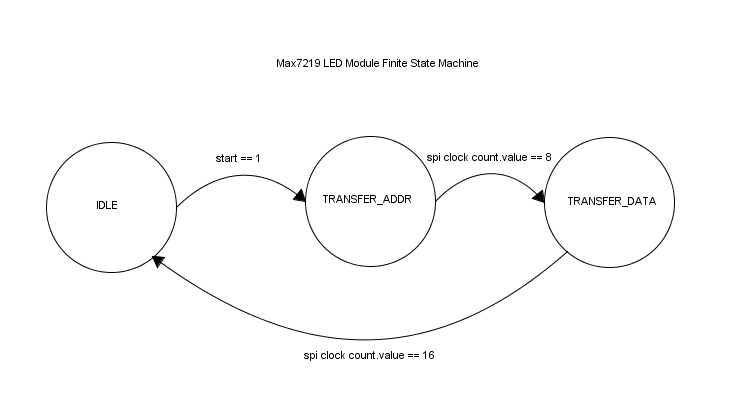 In a previous post, I covered the wiring diagrams, finite state machines, and LED segment encoding for the MAX7219 display module wired up to the Mojo FPGA. In this post, I will cover the Lucid HDL code used to implement the state machines. The first thing to do after creating the project is define the constraints file to setup our pinouts. See the wiring diagram for details. After adding an SPI Master component to the project from within the Mojo IDE, we need to add a new max7219 component to handle our operation states. addr_in is used for our address data (from the MAX7219 Register Map), din is used for the data values coming in, and cs, dout, and sck are all used to manage the SPI interface with the MAX7219. We use busy to indicate that we're not in the IDLE state. start is used to trigger our state transfer from IDLE to TRANSFER_ADDR. Let's continue with the Lucid code. We're initializing the components that we'll use in this module with the clk and rst values coming from the Mojo. We define our finite state machine (fsm) and initialize it to a default state of IDLE. We then initialize an spi_master component to manage our SPI clock and data transfers. 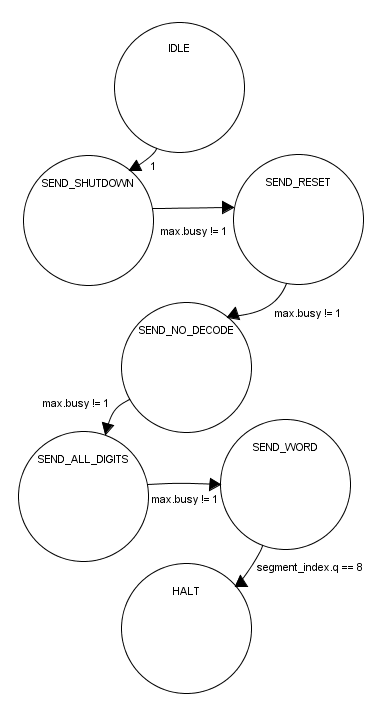 We're using d-flip-flops (dff) to hold the values that we send to the address and data lines because we need to store those values between clock cycles. We're also using a d-flip-flip to store the current state of our load (cs) pin. In lines 1-2, we define a few signals to deal with the output data (what we'll actually send to the MAX7219 display) and the MOSI (Master Out Slave In). We also define a counter to use to keep up with how many SPI clock cycles have passed. This will let us manage the load pin and toggle it at the right time to latch the input data. It's important to notice that in line 8, we set the clock of the counter to our SPI component's sck value. 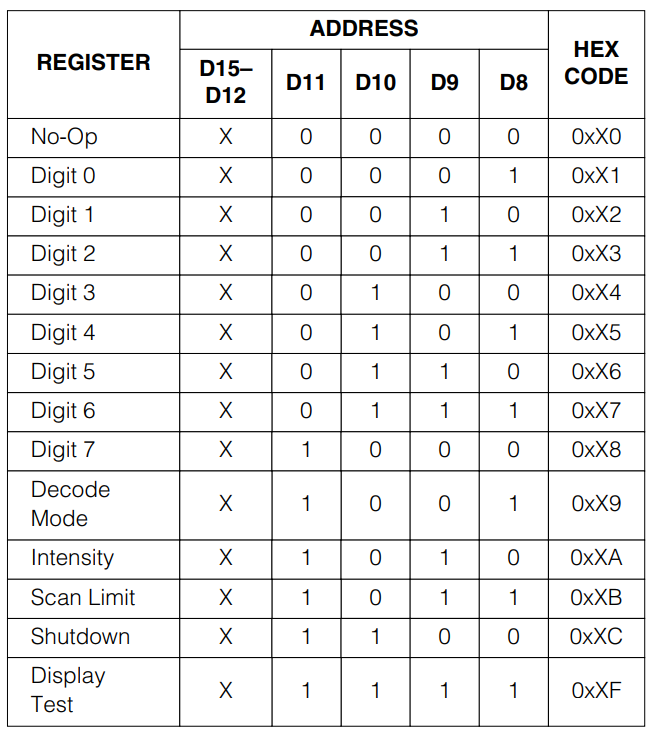 This ensures that our counter only increments in sync with the SPI data clock. It will help us keep up with how much data has been sent to the MAX7219. The last section of code in this component is the state management case statement. During the IDLE state, we first set the load pin high. The load pin stays high until we wish to write data to the MAX7219 (see the Timing Diagram). Then, we check to see if the start value is high. If so, we set the d-flip-flop values for address and data to the values coming in to the component. We then reset the counter and set the load pin low (to start reading into the MAX7219). After all of this, we transfer to the next state. In the TRANSFER_ADDR state, we start the SPI component, set our data_out signal to equal the value of the addr flip-flop and set the dout value to the spi component's mosi value. We repeat the process 8 times total so that the SPI component will send the 8 bits we need for our address value. After the 8 bits are sent, we change to the next state. In the TRANSFER_DATA state, we start the SPI component and set the data_out signal to our data value stored in the data flip-flop. We set the dout to the SPI mosi value. We repeat this process 8 times to ensure that we send all 8 bits of the data to the MAX7219. After sending the 8th bit (our counter is now at 16), we pulse the load pin high to latch the address and data into the MAX7219. We then reset the counter and switch to the IDLE state. In line 34, we set the cs output to the value of our load flip-flop. Line 35 shows how we send the value from our data_out signal to the SPI data input. This is a bit confusing because we're mixing in with out. Think of it like this, we're outputting data from this component into another component. That component has an input that we're matching to our output. Because we're always connecting the dout output to the SPI component's mosi output (lines 18 and 25), our MAX7219 is always receiving its data from the SPI component. It's also managing the serial clock, so everything is in sync. That's everything for the max7219 component. By using this component, we can control the MAX7219 chip from our Mojo FPGA. The next HDL to cover is the main component (mojo_top). This is a bit more complicated, because it uses the component we just covered to display "DEADBEEF" on the display. In line 29, you can see where we use a two-dimensional d-flip-flop to hold the segment data. The first dimension is the segment to display the data on (1-8 on the MAX7219), the second dimension is used to store the binary values representing the actual segment display (defined below as constants). We use the segment_index to keep up with what segment we're currently displaying. These are the binary values for the segments on the MAX7219. I added O and R so that I could display the word "Error". If you are a software engineer like I am, you may be tempted to read this like source code. Hardware Description Languages (like Lucid, Verilog, and VHDL) are not programming languages. We need to have some way of expressing when things take place in relation to other things. Everything in the always block runs all of the time, as the word suggests. That's why we have to manage these states like we do, because this "code" is "executing" every time the clock cycles on the FPGA (the Mojo has a 50 MHz clock). It is truly parallel processing. That's one of the great advantages of FPGAs over microcontrollers. It's also why it's more complicated to manage. The segments are numbered from right to left, so we need to display the characters in reverse order. We do this starting on line 2. Basically, we need to set the data stored in the segments flip-flop to the binary values of the character we wish to display. So, in line 2, the 7th segment (which will be segment 8 on the MAX7219 module) is set to the values stored in the D constant (b00111101). We'll loop through all 8 of these values in the SEND_WORD state and send the value of the flip-flop as the data to the max component. The rest is fairly self-explanatory. We just transition from one state to another, sending in the appropriate address and data values as required by that state to get the desired result. We're not using the SEND_TEST_ON or SEND_TEST_OFF states, so those can be ignored. On line 59, we check to see if our segment index is less than 8. If so, we set the address to the value of the segment index +1 on line 62 (to account for the fact that index 0 should write to segment 1, index 1 to segment 2, etc.) We wait for the max component to finish by keeping these values until the busy flag goes low (line 64). When that happens, we simply increment our segment index by 1. On line 69, we handle the case when the index is equal to 8 (well, technically, it's no longer less than 8, but it's 8 in our case). Then, we simply transition to the HALT state, which does nothing but send a no-op (data 0 at address 0). Starting on line 79, we need to set the output values going to the actual module to the values that we generate in the max component. We set the clock, data, and load pins accordingly. That's it! This will display "DEADBEEF" on the MAX7219 display.